This CellML model runs in both PCEnv and COR to reproduce the published results. The units have been checked and they are consistent. ABSTRACT: A. V. Hill's 1938 paper "The heat of shortening and the dynamic constants of muscle" is an enduring classic, presenting detailed methods, meticulous experiments, and the model of muscle contraction that now bears Hill's name. Pairing a simulation based on Hill's model with a reading of his paper allows students to follow his thought process to discover key principles of muscle physiology and gain insight into how to develop quantitative models of physiological processes. In this article, the experience of the author using this approach in a graduate biomedical engineering course is outlined, along with suggestions for adapting this approach to other audiences. 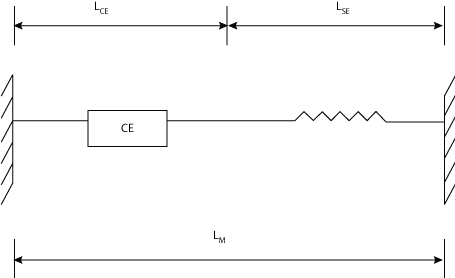 A schematic diagram of the two component muscle model. Force in the muscle = F_SE = F_CE. By specifying Lm, Fm is calculated from the force velocity properties of CE and the force-length relationship of SE. Derived from workspace Holmes 2006 at changeset 43e456c10f5e.